San Diego is a pretty city. Most known of for the Comic-Con convention that’s been happening there annually since 1970, the city offers water views, sunshine and an active, trendy Gaslamp Quarter. About two hours northwest of San Diego, is the Anza-Borrego Desert State Park, which is located in the Colorado Desert of southern California. According to Wikipedia, the park takes its name from 18th century Spanish explorer Juan Bautista de Anza and borrego, the Spanish word for bighorn sheep. The park, which is 600,000 acres, is the largest state park in California and the second largest in the contiguous United States. 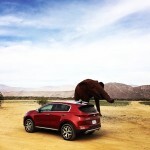 This grand expanse of land was our destination for the Kia Sportage test drive. Unique for many reasons, perhaps what makes the area stand out most are the Art Sculptures of Borrego Springs. These huge, metal sculptures are scattered all over the area. Some of them peek out from behind sand dunes while others loom right over the highway. 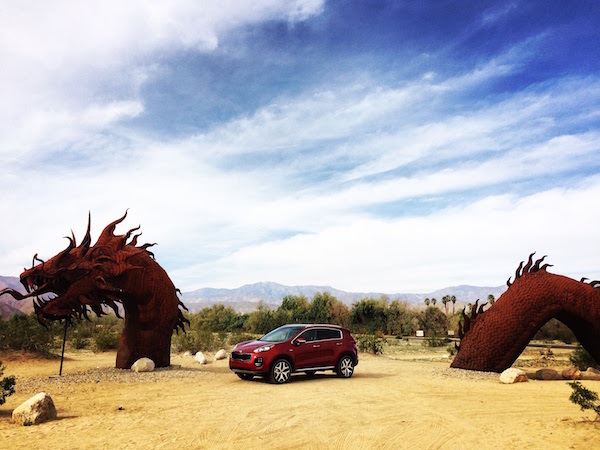 There are 130 rusted sculptures in all, ranging prehistoric mammals to creatures of fantasy like the Borrego Springs Serpent—a 350-foot-long, dragon-like animal that appears to be swimming through the sand. All of the pieces were created by artist, Ricardo Breceda. 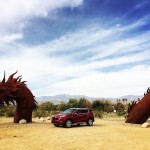 Speaking of sculpture, the exterior of the Kia Sportage is not exactly chopped liver. Especially from the rear, the Sportage looks like a much more expensive vehicle brand. 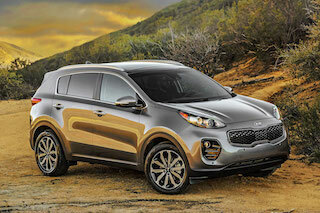 The Sportage is Kia’s longest running vehicle and has been in the Kia family since 1995. As such, it has enjoyed a number of different updates. The 2017 Sportage is packed with consumer safety offerings like a Forward Collision Warning System, Lane Departure Warning, Blind Spot Detection and Rear Cross Traffic Alert, which can warn the driver if other cars are about to pass behind the Sportage. The CUV (Compact Utility Vehicle) market is heating up because of consumers who need extra cargo space but don’t want to purchase a gas-guzzler. In fact, CUV sales are up 18% while sales for the Sportage are up 25% so the vehicle is performing well above average, sales-wise. 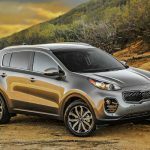 “Simply put, the Sportage is a breed apart in the compact CUV segment,” said Orth Hedrick, vice president, product planning Kia Motors America about the vehicle’s success. 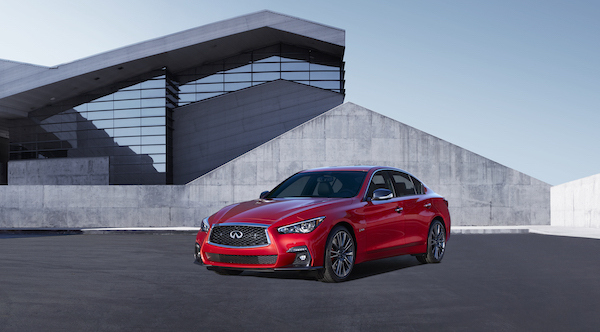 Even though it is technically a “compact” vehicle, it feels much bigger than it is. Plus, during the test drive, the Sportage lived up to its name with sporty handling, via the paddle shifters. 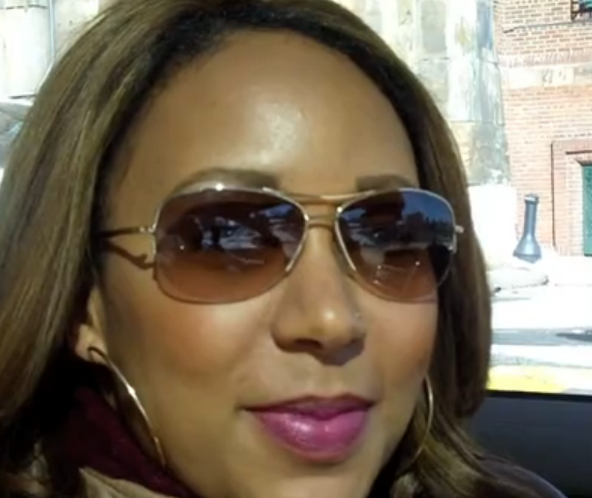 Overall, I felt like the Kia Sportage is a good mix of comfort, functionality and fun. My only complaint is that I wish the “sport mode” drive setting rendered a bit more zippiness and steering responsiveness. Other than that, I think the Sportage is an excellent choice for a compact SUV, especially at such a low price point.